Castello di Annunziata is a classical seventeenth century castle located near Greve in Chianti. Very elegantly designed by a sculptor, this beautiful castle is strategically positioned in the heart of chainti region. The castle is halfway between Florence and Siena, within easy reach to both historic towns. 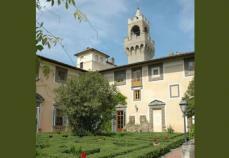 The castle sits in a beautiful Chianti valley close to the lovely historical town of Florence. Annunziata Castle rests in beautiful landscapes with hills on all side. The castle in a temperate climate surrounded by terraces landscapes with predominantly olive trees and green woodland. The surrounding woods are oak and sweet chestnut with some mediterranean pines. The villa is surrounded with borders containing typical mediterranean plants and shrubs such as rosemary, lavender, herbs and numerous wild flowers. In season, there is an abundance of butterflies. 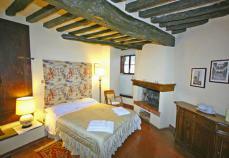 Castello di Annunziata – Aza is a tiny little apartment located inside the castle on the first floor. The apartment has a dining room with kitchen corner. A big fireplace is a attractive feature of this apartment. The double bedroom has a shower bathroom and an easy access to a 12 m2 lovely terrace with the view of the inside castle. 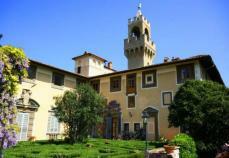 The castle of Annunziata is an ideal place for those who dream for perfect vacation. With easy reach of all major places – Florence 27 km, Pisa & Siena 70 km, Bologna 120 km. There is a train station at just 10km from this villa and also a bus stop at just 100k from the castle. Just book a rental here and visit all these places more conveniently. The castle at Montegufoni has always been a popular picturesque venue for weddings and other special occasions. Staff at the castle are specialized in wedding arrangements and will be glad to organise your wedding with you, offering a complete service and at the same time we are willing to make suggestions which make your wedding reception a unique and unforgettable occasion. The service given is tailor made to meet your every need. The castle in all sleeps 100 – 150 guests to accommodate your guests. There are wonderful activities to participate from this castle like Golf, Horse Riding, Cycling, Trekking etc to make your stay even more enjoyable. At just 30 min from this castle there are spas to nurture a healthy balance in body, mind and spirit by spending an holiday in Tuscany Spa and experiencing traditional, across-the-ages spa treatments and fresh new therapies The castle also hold great art treasure to relish with. Tuscany the unspoiled land of nature is a visual treat for those vacation lovers who long for an unforgettable holiday in Florence Italy !! !